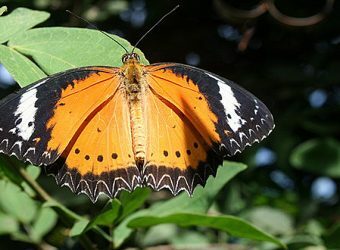 Located in the northern region of the Island, the Penang Butterfly Farm is at Teluk Bahang, approximately 20 minutes from Batu Ferringhi. Apart from butterflies, other insects, reptiles and amphibians are also on display and is well received by children and adults alike. Photographers and enthusiasts won’t be disappointed as there are many different species of butterfly in the enclosed garden. Don’t forget your telezoom and macro lenses. If you turn up in bright coloured clothes, chances are you will have a butterfly standing on you, a perfect photo opportunity. Even for the little ones, there are plenty to do and see. Simpy give them a digital camera and they will be happy snapping away. To make it even more interesting for the children, the farm invented a number of characters based on insects, reptiles and animals. A Nature Guided Tour is also available inside the farm for all visitors. These characters are seen on displays, signs, info graphics and brochures and in the merchandise store. My daughter’s favourite is Orni, a white butterfly with spotted wings, a present from her uncle. To avoid queues, a weekday visit is recommended. Public buses or taxis are available to take visitors from town or Batu Ferringhi right up to the Butterfly Farm. What is nearby: Also situated not far from the the farm is the Teluk Bahang Forest Park. For those planning to it make it a full day in Teluk Bahang, these two destinations will provide you with plenty to do and see. The other place which may be of interest in Teluk Bahang is the water dam. We will be posting a small collection of our photos taken at the Farm soon so do check back. 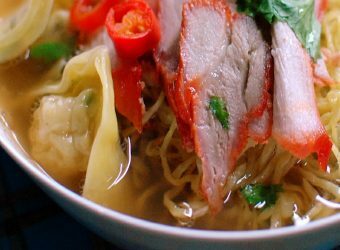 A safe alternative for those not too keen on spicy food, Wan Tan Mee is a simple noodle dish. 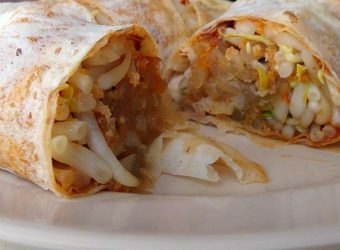 The name Wan Tan translate to Dumpling, a meet parcel wrapped using Wanton skin. The noodle used here are unlike those found on Hokkien Mee or Curry Mee. These are thin springy noodles made from eggs and rice flour. We like to think that a good plate of Wan Tan Mee is all in the Noodle but there is more. A choice of deep fried crispy dumplings or boiled dumplings are available to go with the noodle. Other toppings are sliced barbecue pork (Char Siew Bak), shredded chicken meat and leafy vegetable. 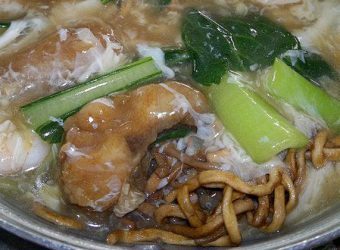 While the more popular variety is the dry or soy sauce version accompanied with a small bowl of clear soup, Wan Tan Mee is also available in clear soup. For the latter variety, boiled dumplings are standard and comes in the bowl of noodle soup. It is also quite common to be served pickled green chillies on the side or sometimes added to the dry noodles. 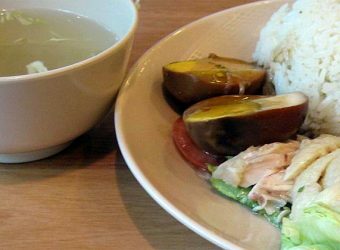 Hainanese Chicken Rice is a tasty and non-spicy meal consisting of a plate of specially flavoured rice, made by cooking the rice in chicken stock and served with a choice of either boiled or roast chicken. 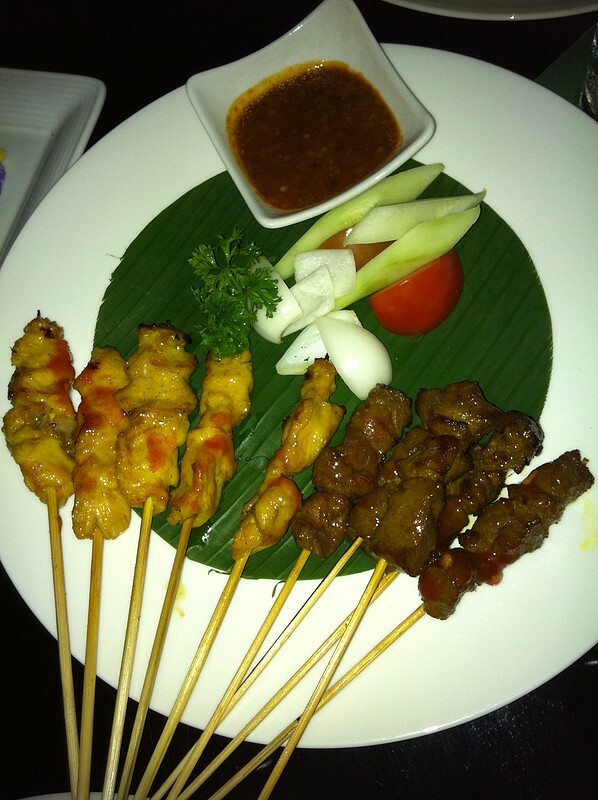 The chicken is drizzled with soya sauce and sesame oil and garnished with spring onions. The meal is usually accompanied by a small bowl of clear soup garnished with parsley, and a tangy light chilli sauce. Add-ons, such as boiled leafy vegetables, hard boiled eggs and delicacies such as giblets and kerabu chicken feet can usually be ordered to complement the meal. Heat Level: Non-Spicy / Chilli sauce served on the side is optional. Authentic Nasi Lemak is a rice dish wrapped in banana leaf to form the shape of a small pyramid parcel and are usually eaten cold straight out of the pack. 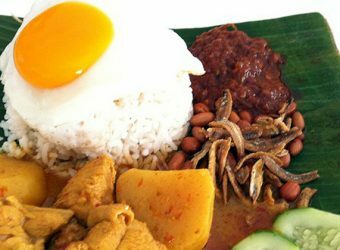 Commonly eaten at breakfast, Nasi Lemak is often found at road side stalls at any time of the day. Nasi Lemak in parcels are a much simpler version and usually containing only one or two toppings while the Nasi Lemak served at a restaurants or hawker centres on a plate, sometimes lined with a cut of banana leaf for authenticity usually comes with a variety of toppings and is usually served with warm rice. The rice is cooked in coconut milk with screw pine leaves (daun pandan) to give it a creamy texture and fragrant aroma. The toppings are usually spicy sambal sauce, cripsy anchovies, crunchy peanuts, sliced cucumber and hard boiled egg. It’s kind of like a national dish, famous among the locals and found in most major restaurants throughout Malaysia. If you fancy a plate of posh Nasi Lemak, pop into the one of the Resort Hotels, and they are bound to have it, at it’s most glorious. 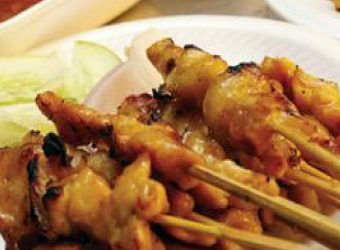 However, we strongly recommend the authentic roadside or hawker stalls that are most sought-after by the locals; it is after all really hawker food. Hawker stalls that specialise in Nasi Lemak, usually also offer a range of different curries, prawn, fish, chicken, a myriad style of eggs cooked hard-boiled, fried sunny side up, deep fried and other side dishes such as assam prawns, sambal stir fried okra. Where to find Nasi Lemak: Sri Weld Food Court on Beach Street (Lebuh Pantai), Red Garden Cafe on Leith Street (Lebuh Leith), Jin Hoe cafe on Cantonment Road (near Pulau Tikus market), food sections of most wet markets, all main Resort Hotels. Heat Level: Spicy / Sambal sauce is spicy. The name Chee Cheong in Cantonese means Pork Intestines while the word Fun means noodle. 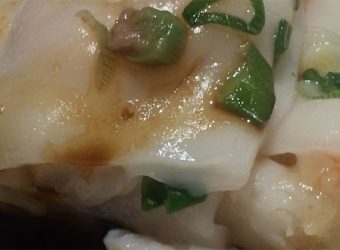 The Cantonese or Hong Kong variety of the Chee Cheong Fun or Cheong Fun in short is served mostly in Dim Sum restaurants. Unlike the sweet variety found here in our other article, this variety is a savoury one. Steamed noodle rolls wrap around a choice of barbecue pork, prawns or dried shrimps is served with sweet light soya sauce and sambal chilli on the side. If you come across a Chee Cheong Fun vendor, preparing steamed Cheong Fun at their stall, it’s great fun to watch. The preparation involves pouring the rice flour mixture onto a muslin cloth laid on top of a steam pot. The flour mixture is spread evenly, and toppings added at one end. It is then covered to allow it to cook, turning the mixture into a large sheet of flat rice noodle. Once cooked, which usually takes only a couple of minutes, the Cheong Fun is moved carefully on a cold marble slab, rolled, chopped and ready to serve. Heat Level: Non-Spicy / Chilli is optional / Ask to not have chilli when placing your order. The dish sounds just as much FUN as it tastes. 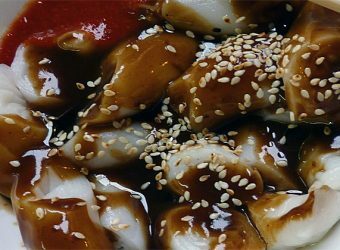 A very simple dish, Chee Cheong Fun is made from thin layer of rice flour usually pre-cooked and kept in a steaming pot. I say pot, but it’s usually a stainless steel box. 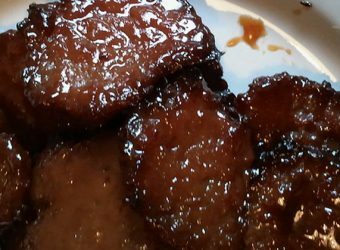 When orders are received, the vendor will take the desired amount out from the box, chop and add a mixture of sauces, hoi sin for sweetness, and shrimp paste for that savoury flavour. Sometimes peanut butter is added to the mixture for a more wholesome taste. The dish is topped with sesame seeds and served with chilli on the side. Usually taken as an accompaniment, a snack or if you like, on it’s own. Just ask for two or more rolls to make it a meal. A Cantonese or Hong Kong variety of the Chee Cheong Fun (or Cheong Fun) mostly found in Dim Sum restaurants is found here. Heat Level: Non-Spicy / Chilli is optional / Ask to not have chilli when placing your order. Usually added on the side. 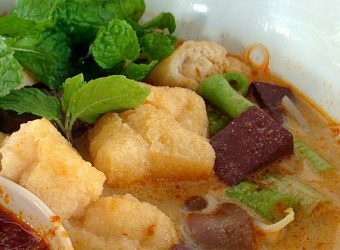 Curry Mee or Curry noodles is a common dish found throughout Malaysia but here in Penang, we make it differently. The soup is based on meat stock with added coconut milk. 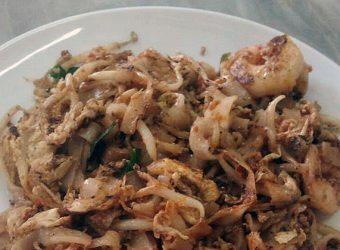 The noodles used here is a mix of medium thick yellow egg noodles (Mee) and thin white rice vermicelli noodle (Bee Hoon) similar to those used in the Hokkien Mee. 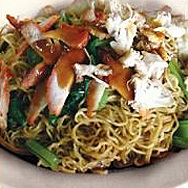 As with the the Hokkien Mee, you can customise your type of noodles, Mee + Bee Hoon, Mee only or Bee Hoon Only. The noodle soup is served with soft dried beancurd, egg, coagulated pig’s blood (optional) and a selection of seafood, prawns, cuttlefish and cockles and garnished with mint leaves or long beans. Usually a spoonful of chilli sauce is served with the dish. Stir this into the soup and watch the colour of the soup turn from white to deep red. Chilli oil in the chilli sauce gives the noodle soup it’s spicy flavour but feel free to ask for a new spoon without the chilli or chilli oil if you are not keen on the hot stuff. 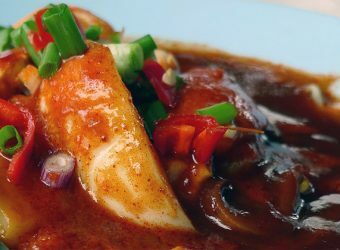 Where available, you can also order Curry Mee with extra ingredients such as large prawns, extra cockles or curry chicken. 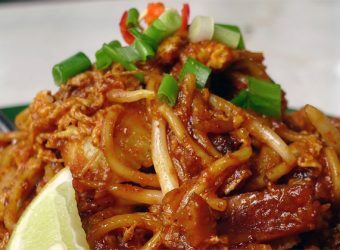 Where to find Curry Mee: Gurney Drive Hawker Center, Curry Mee Stall Kampong Malabar Road, Fettes Park Coffee Shop, New Cathay Coffee Shop in Burmah Road (opposite Bellisa Row), Padang Brown Curry Mee in Anson Road. Heat Level: Spicy with Chilli and Chilli Oil / Chilli and Chilli Oil is optional / Specify your desired heat level when placing your order. The word Kacang is the malay word for nuts referring to the peanut as well as the red beans used in the dish. Ice Kacang is a local dessert prepared with a mixture of ingredients perfect for the sunny weather. 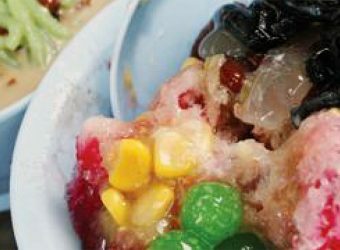 A generous amount of shaved ice with added red and brown syrup and evaporated milk, topped with a mix of red beans, raisins, creamy sweet corn, black and green jelly and crunchy peanuts makes this an irresistible dish. Some stalls offer sliced sea coconut and a scoop or two of ice cream as extras. Definitely a must try for those visiting Penang, especially on a warm day. Chendol or Teochew Chendol to the locals, is another dessert usually available from the same stall selling Ice Kacang. The main ingredients for Chendol are the chewy green pandan jelly made from rice flour, red beans and coconut milk. As with the Ice Kacang, shaved ice is used on the main ingredients and topped with brown sugar syrup giving it that sweet and creamy taste. If there are toppings that you would rather not have, don’t hesitate to ask for it to be left out. 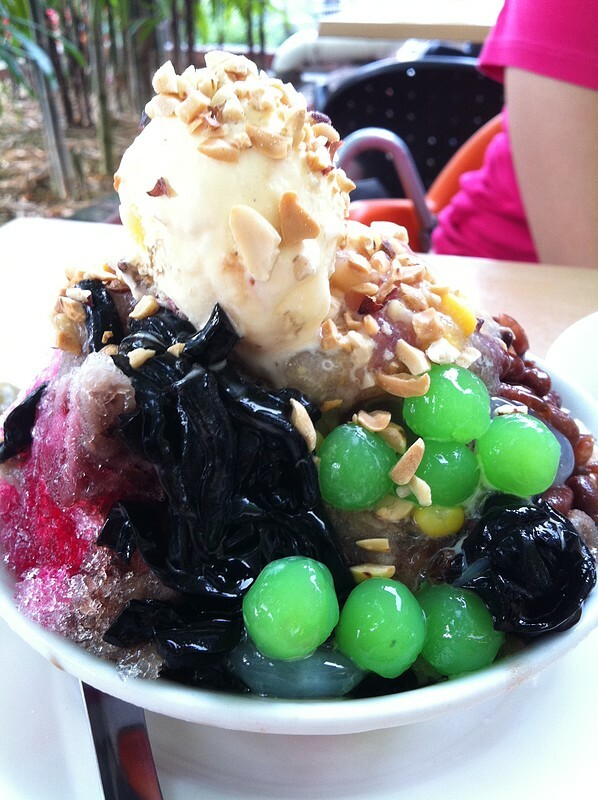 It is quite common to have Ice Kacang or Chendol without the red beans. 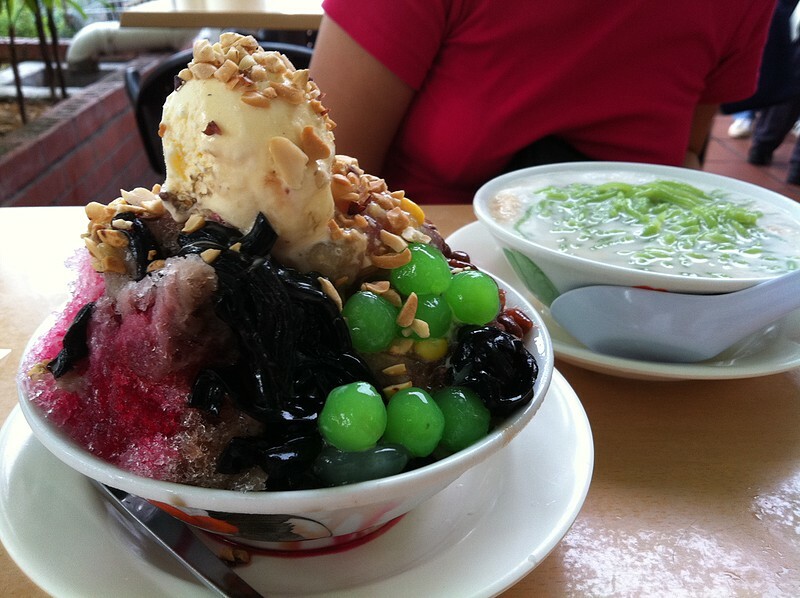 Where to find Ice Kacang and Chendol: Long Beach Hawker Centre, Cecil Market, Astaka Stadium, Gurney Drive Hawker Centre, Penang Road near Joon Hooi Cafe (Famous, only available in the afternoon), Lorong Selamat, Mount Erskine Roadside Hawker Stalls, Padang Kota Lama. 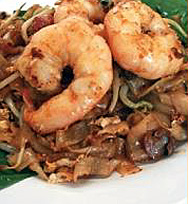 Also know as the Prawn Mee, is a typical breakfast dish famous among the locals. Served steaming hot, the soup is made with prawn stock, onion, chili paste. The noodle is served with thinly sliced pork, hard boiled egg, sliced prawns, bean sprouts and fish cakes. Also available is the thick meat gravy (Loh) instead of or to mix with the prawn soup (Th’ng). 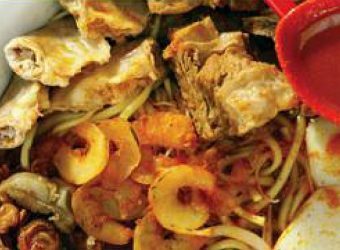 Some stalls vary the toppings and offer optional extras that include pork intestines, tiger prawns, spare ribs, mantis prawns, meat balls, kangkung leaves and fish balls. A spoonful of chilli, although optional gives those for a taste of the hot stuff that extra kick. Heat Level: Spicy / Soup is medium Spicy / Chilli and Chilli Oil is optional / Specify your desired heat level when placing your order.